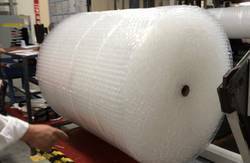 We are the manufacturer and supplier of qualitative range of Air Bubble Sheet Roll. This roll is available in different widths and sizes as per the requirements of our clients and is widely used in packaging and paper processing industries. Our offered product is manufactured at our vendor place ,using optimum quality raw material and sophisticated technology. Further, clients can avail this product in various specifications at affordable prices. Incepted in the year 1999, in Gurgaon (Haryana, India), we “Sri Shyam Packaging” are known as the reputed manufacturer and supplier of premium quality range of Poly Bags, Courier Bags And Multilayer Bags, Zipper Bags, PVC And Vinyl Bags, Tie Pouches, etc. These products are used to carry clothes, medicines, stationery, food product, toys etc. The offered products are highly appreciated for their features like high load bearing capacity, light-weight, transparency, moisture proof, tear resistance and high strength. As per the international quality standards, these products are manufactured using premium quality basic material and sophisticated technology. To meet specific requirement of our clients, we provide these products in several colors and sizes. To maintain the quality, our quality controllers thoroughly test these products on well-defined quality parameters.